Research Interests: Children's literature, with a focus on first-person narration, the relation between words and pictures in picture books, and fairy tale rewrites. 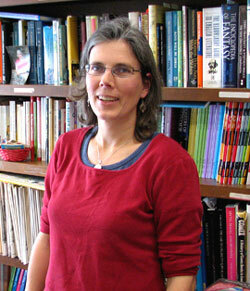 Dr. Schwenke Wyile has taught Children's Literature at Acadia since 2000. She has edited and published a number of articles on narrative theory, Young Adult novels, and Picturebooks. She co-edited Considering Children's Literature: A Reader (Broadview Press 2008) with Teya Rosenberg. She held an Eileen Wallace Fellowship in Children's Literature from the University of New Brunswick, Fredericton for 2007-08, and has been on the Editorial Board of Children's Literature in Education since 2007. As part of SeaStacks, Atlantic Canadian Books for Children and Young Adults, a web-based resource, she has done a dozen video interviews with writers and illustrators. Her central research interests on visualverbal relations and narrative theory have ranged from the pictorialization of music and first-person narration, to narrative engagement with character and graphic metaphor, all of which influence our ways of seeing and reading.